Welcome to the MSC home on the web! With the start of the season quickly approaching, it is important that all members read and follow the Code of Conduct Policy. 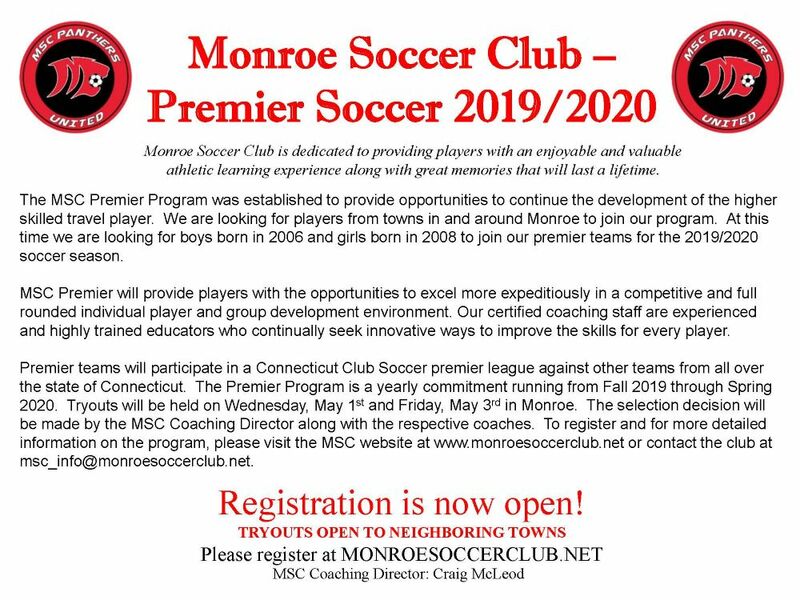 MSC has a zero tolerance in regard to members not adhering to the Code of Conduct policy set forth by CJSA SWD (governing body) and the Monroe Soccer Club. Please take the time to read the below CJSA SWD and the MSC policies ( MSC Code of Conduct ). It is important to understand that when CJSA SWD is involved with addressing any discipline infractions, it will become a reported event with the Connecticut Junior Soccer Association commissioning body in which that board can impose additional suspensions and sanctions beyond MSC recommendations. All games and tournaments that MSC participate in are CJSA sanctioned. Please remember there is no alcohol to be present at any MSC player event, there is no smoking allowed on the parents sideline and no dogs are allowed. All parents, children and spectators are not allowed on the field during practices or games. 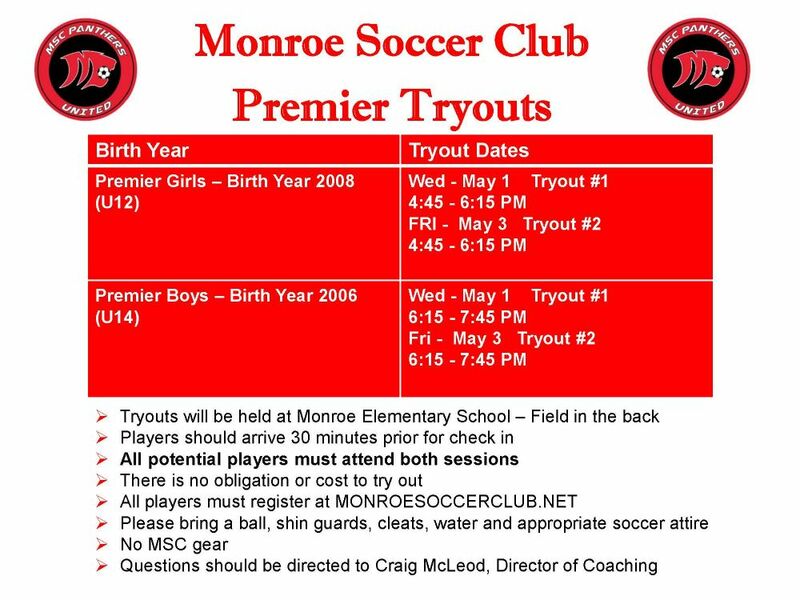 Only MSC players, coaches and board members are allowed on the fields at any time. Please remain in the spectator sections which are located by the benches at Chalk Hill and by the fence area at Fawn Hollow for practices. At games, spectators should remain on the opposite side of the team and at least 5 yards away from the sideline. Spectators are not allowed behind the goals. 24 Hour Rule - Both Players and Parents should adhere to the 24 hour rule: any player or parent/guardian who is upset with a coach, for any reason, should wait 24 hours before approaching any coach or board member with complaints. This rule is intended to let parents and coaches have a cooling/calming down period. After that time, the first thing to do is to discuss the problem with a team manager, if necessary, the coach and/or board. It is the board’s opinion that, after waiting the required period of time, everyone will be able the discuss any problem in a calmer, more professional manner. Practice Policy - The Code of Conduct and 24 hour rule applies to all MSC sanctioned events and including practice. Coaches and Players are the only ones permitted on the fields. All others including parents and siblings must stay within the designated areas for safety reasons. Our objective is to enhance every participant's enjoyment of his or her experience. To better achieve that goal, we are outlining a Code of Conduct for all team officials, parents, players, coaches, and club volunteers involved with the MSC. The Code of Conduct requires members to abide by the rules and regulations of the game (as set forth by FIFA, USSF, CJSA SWD and the MSC) and to maintain a cooperative attitude and uphold the ideals of fair play and sportsmanship. This Code of Conduct is a written contract between individuals and the MSC. This contract is more than just paper, it is the essence of our purpose and philosophy and thus adherence to it is of primary importance. Flagrant or consistent failure to comply with the code of conduct will result in disciplinary action. The players, and parent's/guardian's signatures on the registration form constitutes written approval of the contract by the entire family. Coaches agree to abide by the Code of Conduct by affixing their signature to their contract. Team officials, parents/guardians, players, coaches, and club volunteers are expected to show a positive, respectful attitude for everyone involved in the sport as well as the club. Excessive or abusive criticism and disrespectful for officials, opponents, teammates, coaches or supports undermines the purpose of the sport and brings to bear stress beyond the competition and not keeping with the spirit of the game. • Vulgarity by team officials, parents/guardians, players, coaches or players. • Harassment or belittling of officials, spectators, coaches or players. • Physical violence or the threat of physical violence toward anyone at any time. • Verbal abuse directed toward anyone or the taunting of opposing players, coaches or parents. A) The Referee – On a soccer field the referee is the symbol of authority and often the target of criticism. The referee's job is a difficult one and all referees are human and do make mistakes. Anytime you feel your team is being treated unfairly or you have an unqualified referee, talk to your team manager after the game. Team managers are asked to inform the MSC Referee Coordinator of any problems that occur with officials. In accordance with FIFA laws, verbal abuse towards referees could result in a red card and ejection for the player or the removal of a coach or spectator. Referees have the authority to suspend play or abandon the game if a team official does not or cannot control his/her players and/or supporters. B) The Opponents – Players, parents/guardians and coaches are required to maintain a sense of fair play and be respectful of opposing players, coaches and supporters at all times. Any action deemed disrespectful will be punished under the guidelines of the violations section of this code of conduct. Sportsmanship begins with respect. CJSA policy manual section 10, and appendix J, as well as SWD policy and guidelines section IV, in conjunction with the MSC Code of Conduct, set a minimum standard of discipline that is expected of players, coaches, and spectators. The responsibility for enforcing proper conduct at SWD events rests with the host team official (manager, coach, and/or club officials). Any questions or disputes concerning the violations of this code of conduct as listed below can be brought before the MSC Review Board. A) Player Conduct – A player receiving a red card will be ejected from the game immediately and will not be able to participation in his/her team's next match. Repeat offenders could face further sanctions as determined by the coach or an inquiry by MSC, SWD or CJSA. If a red card issued to a MSC player for violent conduct, serious foul play or abusive language the player may be suspended from participating in an additional game. The MSC may decide to extend the number of games the player is suspended based on previous card history or on the seriousness of the action taken by the player that earned a card. Players who are abusive of coaches, other players (including teammates) or the referee may be banned from attending matches for one week (at least one game) if their coach so desires. Coaches may also recommend further sanctions at an inquiry of the MSC Review Board. B) Parent/Guardian/Spectator Conduct – Any parent guardian or spectator who is ejected from the game by the referee must remove themselves from the playing area immediately. SWD policy stipulates that the removal shall include exclusion of the offender for an additional two games of a like kind. He/she will be banned longer if so determined by an inquiry of the MSC Review Board. C) Conduct of Team Officials – Any coach ejected from a game must remove himself or herself from the sideline immediately and depending upon the actions of the referee may possibly not participate in some number of subsequent games. Coaches who are abusive of other coaches, players, or referees may be banned from attending matches for one game or longer if so determined by an inquiry of the MSC. A) Investigation – In the course of any game, function, or activity sponsored by or played under the auspices of the MSC, if a fight, disorder, or other incident occurs in which a team, player, coach, adult volunteer, trainer, or parent/guardian or other member of the MSC is actively involved, the President or his/her delegate may on their own initiative, or at the request of any member of the board of directors, request an investigation of said incident by the MSC Review Board. A report and recommendations of any actions deemed appropriate shall be made to the President or delegate within two weeks of the Review Board's knowledge of such incident. B) Appeal – There is no appeal process unless the President or Vice President deems it appropriate. Any motion to appeal must be insisted through the President or Vice President. The SWD will not tolerate any unruly behavior by its players, coaches, managers and spectators at matches. By attending a SWD competition, practice or other sponsored activity, all persons submit to proper behavior in accordance with all the provisions of the discipline policy contained herein. The responsibility for enforcing proper conduct at SWD events rests with the host team officials (manager, coach and/or club officials). All participants and spectators agree to cooperate with team officials and will depart the playing environment when instructed by the team officials. Host team officials agree to be held accountable for improper behavior of all participants and spectators, including maintaining a safe environment for players and referees. 1.With the exception of team captains, no player, team official or other participant or spectator is permitted to address the referee without the referee’s explicit consent. 2.Participants and spectators are not permitted to use abusive language or confront referees, coaches, managers or players of either team. Verbal or physical abuse of any participant or spectator is prohibited. 3.Coaching by spectators is prohibited. Spectators must not instruct players on the field during the match. 4.No one may enter the field of play without the permission of the referee. In the event of injury, the referee will signal to the coach or other team official to enter the field of play after play has been stopped. Spectators are never to enter the field of play unless the referee deems it appropriate in the circumstances. 5.Aggressive, threatening actions, whether verbal or physical, are grounds for removal from the playing environment. 6.All participants and spectators must stay at least 5 feet behind the touch line. Participants and spectators are not allowed behind either goal line. Only team officials are permitted to be with players on the sideline; spectators must remain on the opposite sideline. Complaints may be submitted to the league commissioners. The referee has authority over the field of play and its environment from the time of his or her arrival until departure. No team official, club representative, participant or spectator may interfere with the referee’s authority. The referee has the authority to suspend, terminate or abandon a match and may eject a team official or compel a team official to remove any and all spectators. Law enforcement personnel and emergency responders are permitted on the field as necessary. All participants and spectators submit to the authority of the SWD and its disciplinary committee. Any finding and sanctions issued by the discipline committee will be binding upon the club and individuals involved. Any individual who breeches a sanction imposed by district officials, risks additional sanctions (including expulsion) and possible further sanctions against the club and all of it’s teams. The club has the responsibility to uphold district sanctions and aid in their enforcement. If a spectator is ejected for misbehavior or referee abuse, she/he at a minimum will not be allowed to attend the next two games of similar competition. If there is a second ejection of a spectator from the same team, that team may lose all remaining home games and may have to pay referees. A second ejection may also result in forfeiture of league games. The Manager, Coach and/or club is responsible for making spectators aware of this policy and ensuring its enforcement. Violation of the rules and the terms of suspensions and sanctions imposed by CJSA or the district may be posted on the district web site. Please click the link and read the CJSA Concussion Awareness Form. Share this information with your child.